How To Cut Video for Samsung Note 3 by idoo Video Editor? Galaxy Note 3: To Have 8 Core CPU And 8 Core GPU? Definitely Samsung GALAXY Note 3 attracts our eyes and there are always guesses and rumors around it. Recently, Sammobile said that, according to their trusted insider, the Galaxy Note III will be Samsung’s most wanted device, which will have a 13 megapixel camera, an Exynos 5 Octa-Core processor, Mali 450 GPU with 8 cores and 3 GB of RAM. More than that, the Galaxy Note 3 from Samsung will have a 5.99”Full HD Super AMOLED display with diamond pixel structure, which is the same one used in the Galaxy S4. Is it real? Let’s wait and see. We often want to cut the video and convert the video format. 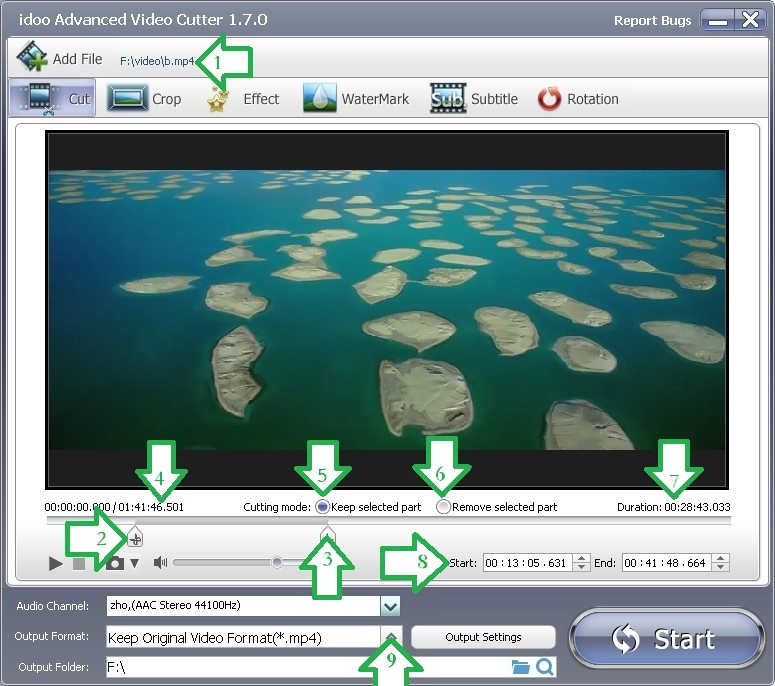 It is an easy job to convert the video into other formats, and most video editor can do it. However, what about to convert video into formats for a certain mobile device or media player? 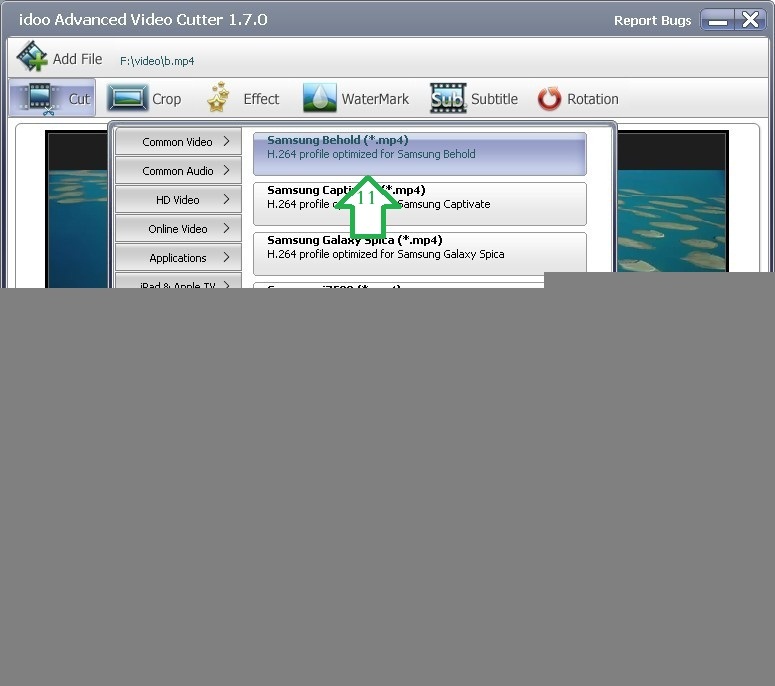 For example, if you have a Samsung phone, you may well need a video converter for Samsung. Besides, it is important to cut the videos, especially for those mobile devices, and we may also need to do some other jobs to the videos: to effect them, to add watermarks and subtitles, to rotate them and so on. idoo Video Editor is just your ideal Samsung video editor, as well as a great Samsung video converter. Now you can free download this tool here. You can easily cut your Samsung GALAXY Note 3 videos, and convert videos into the formats for your Samsung, just try this idoo Video Editor. 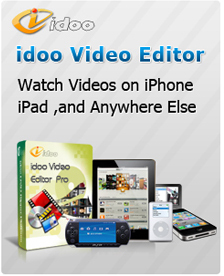 idoo Video Editor is compatible with various OS, such as Windows 8/7/XP etc..
2. By adjusting the time sliders (Arrow2&3) to select the start and end of the part you want. The length and current time are showed below the screen (Arrow4). 3. Determine the cutting mode: to keep the selected part (Arrow5) or to remove the selected part (Arrow6). 4. The “Duration” (Arrow7) shows the length of the cut part. 5. The start and end time can be also adjusted by putting in the exact time in the boxes (Arrow8). 6. Click the drag-down list of “Output Format” (Arrow9). 7. You may select your target video format, “Samsung Behold” (Arrow11) from “Samsung” (Arrow10) file types. 8. Click “Start” (Arrow12) to begin editing. What Does idoo Video Editor mean to you HTC?